Imagine if we discovered that the world would cease to exist in thirty days. In the first week, the media would be diligent. Presenters would appear with charts explaining what had caused the apocalypse and TV studio sofas would be full of interviewees agonising over losing their savings. Unfortunately, 30 days is a long time to sustain a media story. The Tsunami in Japan barely lasted a week as headlines. By the thirtieth day of the apocalypse, the professional media would have moved on. We would all perish on the final day without a mention on the TV. 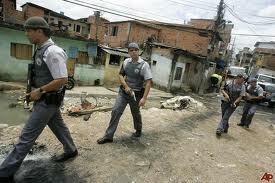 Six days ago, the British media reported that violence had exploded in Sao Paolo and that it was likely to increase. Since then we have heard nothing. The most recent item on Google describing the possible escalation of further violence is 6 days old. When I was in Brazil I was told by a teacher from Belo Horizonte that the most important political issue for the people was violence. Brazil has twice the murder rate of the USA. Indeed, the ambition within Brazil is to achieve the level of crime that exists within the USA. The notion that perhaps the USA is not the best example of law and order is usually ignored. ‘If only,’ said the teacher from Belo Horizonte. Sao Paulo is the most important city in Brazil. Sao Paulo is where the decisions are made. It has a population of 20 million people and that compares to London. In the good days, the ones before the recent explosion of violence this November, six people would be murdered each day. That average has increased to ten. The 20 million less the ten that they keep losing every night are not happy. Some believe that ordinary Brazilians need to arm but these people have clearly been watching the wrong Westerns. The shopkeepers will not win gun battles with members of the First Capital Command. This is the name of the gang that is in dispute with the police. The name reflects the parochial pride and contempt for Rio De Janeiro that exists in Sao Paulo. The gang emerged in 1993 inside Taubate Penitentiary to protest against what even the Justice Minister had described as a ‘medieval penal system.’ Prison life is brutal in Brazil but the regimes are often liberal. The horror is a consequence of overcrowding. In 2001, the FCC led a revolt that spread to 29 prisons across the state. 19 inmates were killed and it took the police 27 hours to quell the riot. 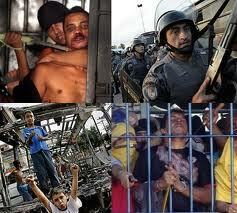 where they would be unable to use their cell phones to control crime within Sao Paulo. I know, surely it would have been easier to remove the cell phones. The FCC declared war on Sao Paulo. For five days. the gang attacked its rivals and the police. 175 were killed including police officers. Because the violence remained heightened, the gang and the police made a pact to slow down the transfers of FCC members to the distant prisons. It makes sense but the Brazilian authorities do keep picking inadequate law and order models. The FCC were shocked that the authorities could break an agreement. If there has been a period of calm in the last week, few expect it to last. The situation has never been desirable. 94 police were executed last year by the FCC. Residents fear that what happened in 2006 could be exceeded. The FCC is powerful. It has 1000 leading members and over a 100,000 people connected to the organisation. The leaders each pay $300 a month to cover potential legal and medical costs. No wonder they resent gun toting policemen and ambitious State Governors. The human rights origins and the progressive insurance scheme do not, though, reflect left wing sympathies. The FCC like the slickest global companies has proved adept at outsourcing. This includes the killing of police officers. Maybe the gangsters become too attached to their iPhones although it probably was more a consequence of crime being organised from inside Sao Paulo prisons. And, if they have outsourcing, nobody should bet against a state of the art just in time delivery system. The 100,000 people connected to the FCC would normally equate to the GDP of a small English town, the kind that in the north of England produces a not too spectacular Rugby League team. But these people deal in cash equivalents far greater than that of the average Rugby League supporter. We have to have sympathy for the authorities. They are desperate to reinvent favelas. 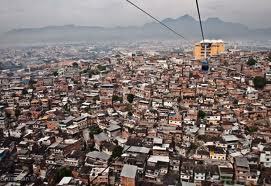 Rio has installed a free cable car for the favelas in a serious attempt to integrate the rich with the poor. And the authorities insist that they would have still done it even if ambitious politicians had not urged serious bids for the Olympics and the World Cup. Sympathy for the urban powerful in Brazil should be muted. The high level of crime in Brazil is a consequence of the huge disparity in income between the rich and poor and the belief of its establishment that people will survive providing an entrepreneurial spirit is bedded into the culture. Brazil has plenty of self-employed citizens. They crowd the pavements selling all kinds of goods that nobody is really interested in. They do it with the hope of living on a pittance a day. Not all can muster the required determination. Plenty simply give up and lie down in the sun. The outbreak of violence in Sao Paulo occurred as the last episode of ‘Brazil’ by Michael Palin appeared on BBC TV. He was positive and anticipated a bright future for the country. The people of Brazil are likeable but the problems appear to persist. The endless drive needed to merely survive is enough to shame any visitor from affluent Europe. But the determination and the self-reliance have a dark side. The ruthless introduce outsourcing, just in time drug delivery and executions. Cameron and his Tory enthusiasts for untaxed wealth and a dismantled welfare state need to be careful of their wishes for the future. They imagine a deregulated UK that will become like Hong Kong. Some of them talk about abandoning the north of England. They talked the same way about Liverpool in the 80’s which of course became the centre for the UK drug trade. Its gangsters may not have introduced outsourcing but they were innovative. Locals speak of Curtis Warren and his mega ton drug deals with awe. Thanks to failed economic policies the UK already depends on food banks for those in hardship. The population has been defined as suffering from nutrition deficiency. UNICEF are monitoring what is happening. Meanwhile George Osborne, like a failed England football manager who has picked the wrong players, mutters platitudes about the difficulty of his task. No, we should be wary. If the Brazilians can pick inadequate law and order role models then our own political clowns are more than capable of selecting completely inappropriate economic and social systems. If you want to read about Frankenstein and the social and political radical that created his story click here. If you want to read about the connection between the Frankenstein Creature and Elvis Presley click here. If you want to read about the book on Liverpool crime that will be published next year by Red Rattle Books click here. 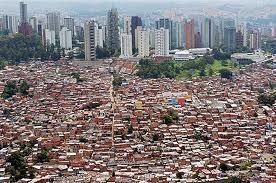 What an informative piece which depicts in detail the situation within Brazilian Cities. The recent Michael Palin series was well bleached of such events and yet such are the ongoing difficulties which face nationals of that country. It also highlights what can happen when the state loses control to less scrupulous factions and then attempts to regain the initiative to impress the world stage for the forthcoming World Cup and Olympics. A very interesting and an incredible blog post! I did not watch the Michael Palin series on Brazil, although I am currently reading a book called ‘Innocent Mosquitos’ by a Mr Howard Jackson, and it is informative, like this post. It is amazing how a country which has produced wonderful images and an awesome football team, is still having such violence in this present time. It will be incredibly interesting when both the Olympics and World Cup are showcased here for the whole world to view. Great post with a plethora of phenomenal information and a real insight into a country which is both fantastic and awful at times. If the Brazilians can pick inadequate law and order role models then our own political clowns are more than capable of selecting completely inappropriate economic and social systems. Reads like America’s suicidal, economic jump from the forthcoming fiscal cliff.